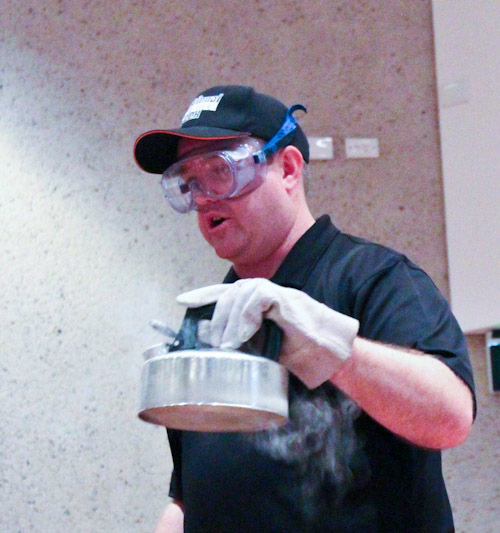 During our visit yesterday to the Sciencentre at the Queensland Museum, we attended a special show on liquid nitrogen. Offered as part of the National Science Week program, the talk was informative and fun — and it is repeated every day this week. 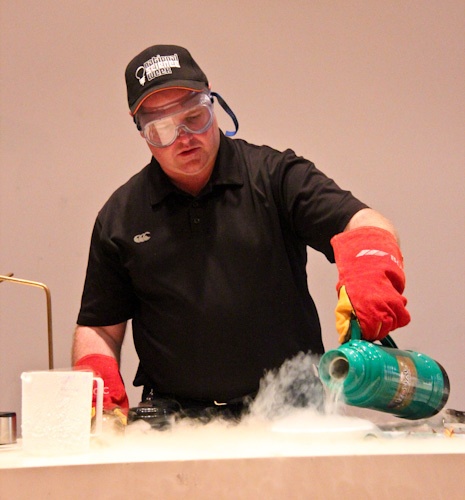 Resident science educator Paul Brandon pours liquid nitrogen out of its insulated containers so he can demonstrate what happens when different objects are deep-frozen. The extreme cold causes the air around it to condense — essentially creating a mini-cloud wherever it sits in liquid form. Because we associated "boiling" with heat, we forget that it's actually only a physical change and can happen at different temperatures. Nitrogen boils at -196°C/-320°F and causes the kettle to whistle. Although the talk is geared at older students, Brioni and Aisha are able to understand what is going on and speculate what will happen during each experiment. 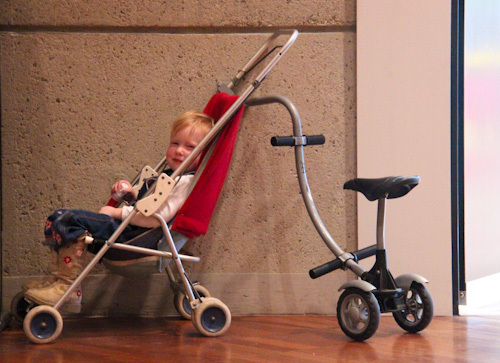 Two-year-old Delaney finds it a bit dull and returns to the comfort of her pram across the room. 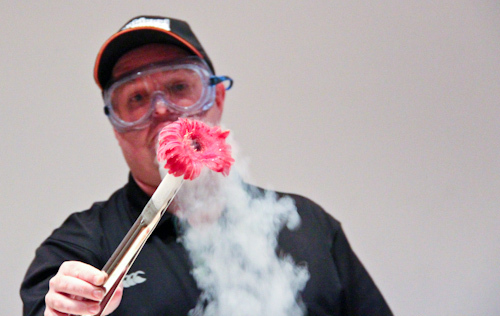 When a flower is snap-frozen in liquid nitrogen, it becomes completely solid while retaining its perfection. However, it can be easily crumbled into a zillion pieces by crushing it in one's (well-insulated, gloved) fist. The pressure from the boiling liquid nitrogen causes the lid to pop off the tins. 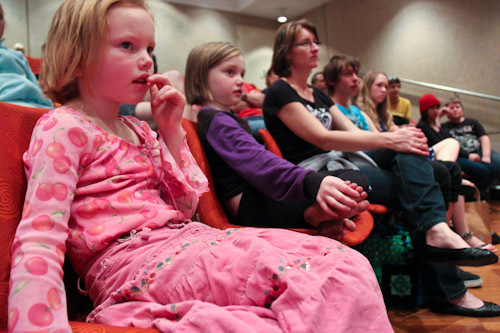 Paul Brandon often invited children from the audience to participate in his experiments. 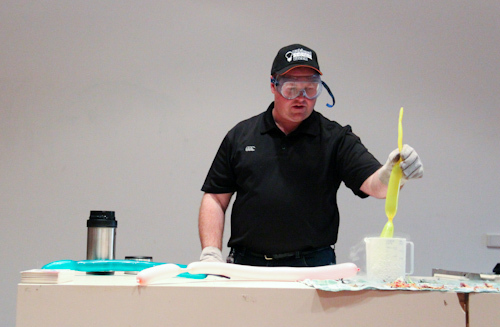 Although they did little more than don safety glasses and gloves, they felt close to the liquid nitrogen and provided an alternative to just watching one man. 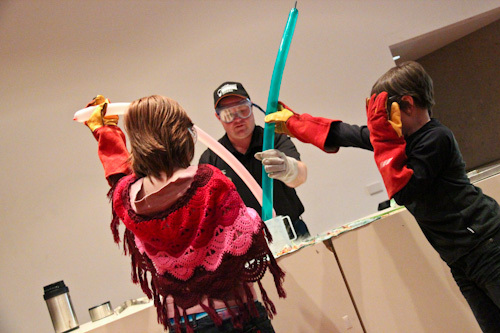 Two children push long balloons into the liquid nitrogen. What will happen, do you think? Slowly, the balloons almost disappear into the plastic jug. Did the air leak out? When the balloon is immersed in the liquid nitrogen, the air inside it returns to a liquid state. As soon as it warms up again, it re-inflates the balloon. Think of it as an instant party: balloons deep-frozen can be released into a room and they'll inflate themselves. 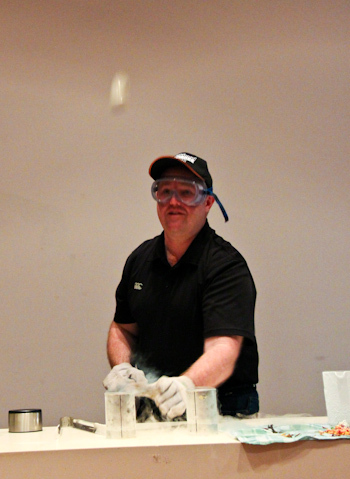 Paul also showed us what happened to three balls when they were frozen. The ping-pong ball survived unscathed. The tennis ball crunched when stepped on. A rubber hand-ball (like a raquetball) shattered into many pieces. 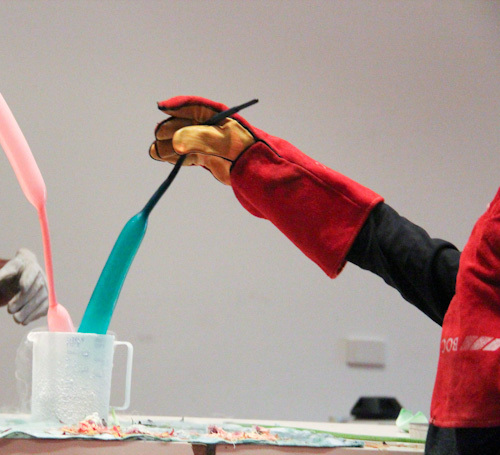 The Liquid Nitrogen Show was a fun one to attend, and it certainly started some interesting discussions among my girls. If you’re in southeast Queensland, you can still catch it at certain times at the Queensland Museum for the rest of this week. Go explore!